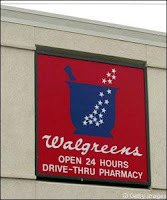 This is, in my opinion, a totally lame week at Walgreens. I will probably just pick up some joint juice to roll, some Crest Rinse, maybe a razor, maybe some NyQuil & Puffs and that's probably it unless some other hidden deal comes along. If you have any Bayer Monitor Qs left or you need vitamins or asprin then you could do the Bayer deal too. I guess I'm totally spoiled at this point with Wags but I'm really not seeing anything exciting. If you spot a deal at your store let me know! Bausch & Lomb Soothe XP Lubricant Eye Drops .5 oz.